In a Japanese game, the score is the sum of captures and territory. Seki does not count as territory. If the board enters a long repeating cycle that neither player wants to break, and which is of advantage to neither player, the game is scored as no-result. Note: The Japanese system of solving disputes that happen at the end of the game is not available. If players cannot agree whether a group is alive or dead, they must accept the judgement of a third neutral player. In a Chinese game, the score is the sum of territory and stones on the board. The positional superko rule is used to prevent long repeating cycles. If players disagree about the life and death of stones after the game ends, they simply undo and play out the situation. The white player is given one point extra komi for every handicap stone that Black gets at the start of the game. Free placement of Handicap Stones is used. AGA (American Go Association) rules on KGS use the "area counting" option. That is, they are played the same as Chinese rules, except that the white player is given one point of extra komi for all but the first handicap stone that Black gets at the start of the game. The AGA also lets players count the score by territory, as in Japanese scoring, but the AGA rules are set up so that the two scoring systems always give exactly the same final result for the game. Since KGS always does the counting for the players, which system is actually used doesn't matter. It is a good idea for both players to fill the dame at the end of a game. This is especially important for sdk's and ddk's. Filling all the dame is any easy way to tell if the game is really over. Here are the technical details. A player loses one point every time they pass and their opponent fills a dame. AGA dame (dah-mee or dah-may) are the empty spaces between the opposing player's territories that do not effect the final score, assuming that both players fill the dame without passing. Whether or not all the dame are filled, the game is over when both player pass. The definition of dame under the Japanese rules is a little bit different. 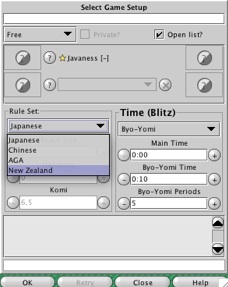 Whether or not a "Japanese dame" is filled can affect the final score under the Japanese rules. When one player fills a "Japanese dame," the other player must play one or more stones inside their territory to avoid losing points. Japanese dame can occur at the end of a game played with AGA rules. They can be tricky to spot. But, they are easy to see when all the dame are being filled. This is one of the reasons that it is especially important for sdk's and ddk's to fill the dame at the end of a game played under AGA rules. In fact, it is easy to miss a dame and pass because you think the game is over. If the other player fills the dame, you lose one point. Most games on KGS are played under Japanese rules. But, if a person is preparing for an AGA tournament, they may well post games with AGA rules. New Zealand rules are like Chinese rules except that playing a multi-stone suicide move is allowed. This is the only rule set that permits this kind of suicide. AGA Pass Stones - If you pass when you could have filled a dame at the end of the game, and your opponent fills the dame, you lose one point. This follows from the AGA rules on pass stones. AGA Official Rules of Go The definition of a pass stone is in Rule 7. The AGA Rules of Go: Commentary The fact that pass stones are treated like prisoners when the game is scored is mentioned in the subsection "Using Pass Stones" in the "Key Issues" section of the "Transmittal Letter" found in this AGA web page.